I can't believe its 60 today and its supposed to snow in about 12 hrs....Hard believe it will stick to anything. Am I hearing a bigger storm for Fri-Sat?! This is nuts. jmanley32 wrote: I can't believe its 60 today and its supposed to snow in about 12 hrs....Hard believe it will stick to anything. 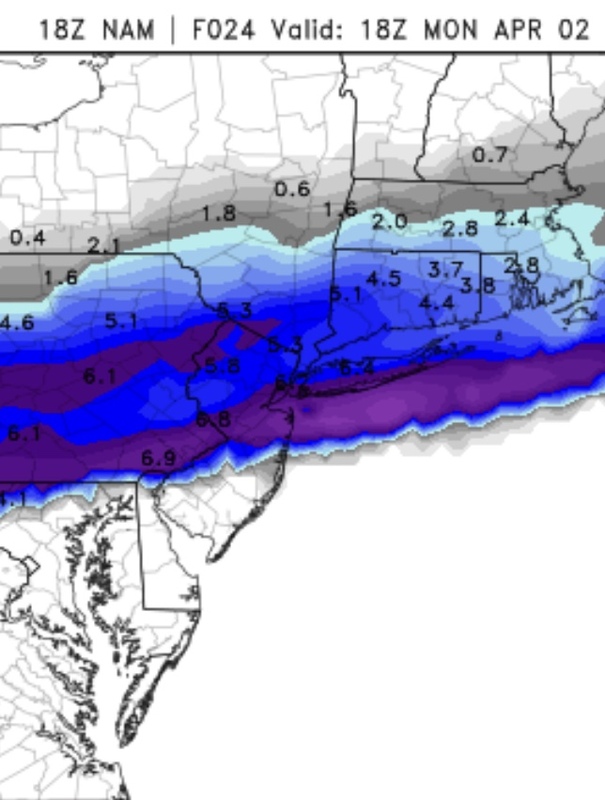 Am I hearing a bigger storm for Fri-Sat?! This is nuts. The only hope is that the sun isnt shining bright. 60 with all the pavement/asphalt etc soaking up direct sunlight asorbs and stores alot of heat. The NWS discussion still had some uncertainty with UHI acclumation. Sounds like they contemplated leaving the city out of the Advisory but decided to play it safe and include everyone. Wind has shifted to the northwest and dewpoints are 38* (forecast to be upper 20s overnight). Temps in Ohio and western PA have dropped into the upper 40s, so colder air is approaching. Right now the HRRR has most people at or below freezing by 5 or 6 am. With dewpoints in the upper 20s easy to see how quickly the temps will drop once the precip gets going, which should start by 2 or 3 am. Very key factor here for roads is how heavy the snow gets before 7 am. With no sun and less traffic, areas that are in heavy snow at 5 or 6 am should see snow covered roads except maybe the major highways. If the snow is light, it will have a lot of trouble sticking on any road surface at these temps. Skins sounds nice for now but if you’re still at 61 in the poconos grab your sweater because it probably will drop into the low 40s in the next couple hours. billg315 wrote: Skins sounds nice for now but if you’re still at 61 in the poconos grab your sweater because it probably will drop into the low 40s in the next couple hours. If the temp there hasn’t dropped yet it should soon. I just checked and Mt Pocono and Lake Harmony are 40 and 43. Your drop can’t be far behind. 44.8 and waiting on the snow. Need 2.8 to go over 80, after that I'm just rooting for historic April numbers in NYC. 13.5 is the record for April in Central Park. Let's get some tomorrow, next weekend, maybe next Tuesday. Go big or go home. CPcantmeasuresnow wrote: 44.8 and waiting on the snow. if the GFS forecast for next weekend holds you’ll be over 90 challenging 100. Whoa. It’s been awhile. I think it’s time to re write history. Don’t you think? Clear skies already down to 50* from a high of 60. Dewpoint 34*. Down to 45 in Clifton. Feels much colder. No clouds. How often do you see it snow when there is an H right over you? Looking at radar the storm is trucking in from the Midwest. Was over MO/IL a couple hours ago now over IN/OH. 47 here. Hoping for 4” which would give me 70”+ for season. Did have an inch last Sunday. Kids Easter egg hunt was fun in the snow. Temps won't be an issue here, let's see if the qpf comes through.